/Enterprise Dashboard & Widgets /How to Add Twitter Feeds in Mangoapps? A Twitter widget can be added on user dashboard company pages or teams (projects/department/groups) pages. Please note that the widget on company or team pages can only be added by company admin and team admin respectively. From your Dashboard or Company pages or Team pages, click on “Customize” to add the widget. 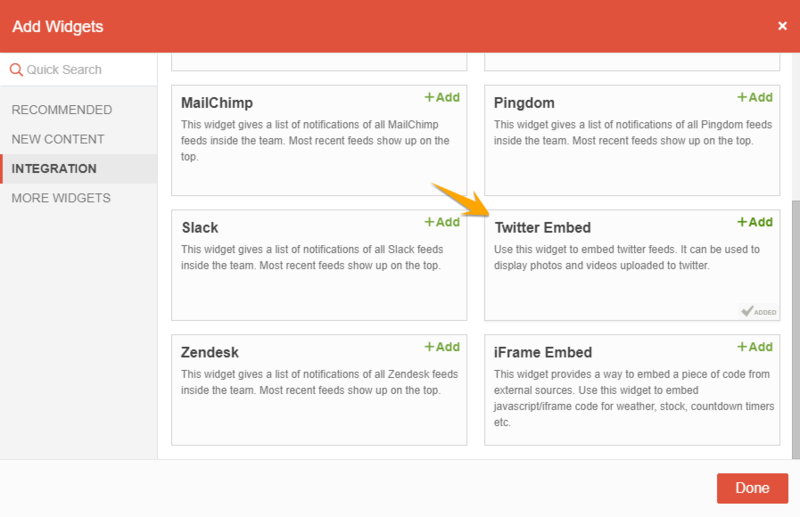 Select the widget “Twitter Embed” widget under the Integration category. Paste the iframe code copied from your Twitter account to the “Twitter Embed”. Refer the following steps to generate the iframe code for your Twitter account. Open www.twitter.com in your web-browser and login using your credentials. Under Settings, click on widgets and “Create new” widget. After creating the “Twitter widget” in your Twitter account, copy the iframe code from Twitter and paste it to “Twitter Embed” widget in MangoApps. You will now be able to view Twitter feeds on your dashboard or team/company pages. Please note: It takes few minutes for Twitter feeds to appear on the “Twitter Embed” widget. Customize the design by specifying the height, theme (light or dark), and link color to match your MangoApps. Copy and paste the code into the “Twitter Embed” widget in your MangoApps wherever you would like the timeline to appear.